Eklavya College of Pharma (Eklavya College of Pharma), Sangli Published Job Notification for 10 Principal – Lecturer in Pharmacy & More Posts. Candidates who wish to apply must look at Eklavya College of Pharma Recruitment 2017. Eligible candidates can come for walk-in-interview as on 11-06-2017 at 11.00 a.m. 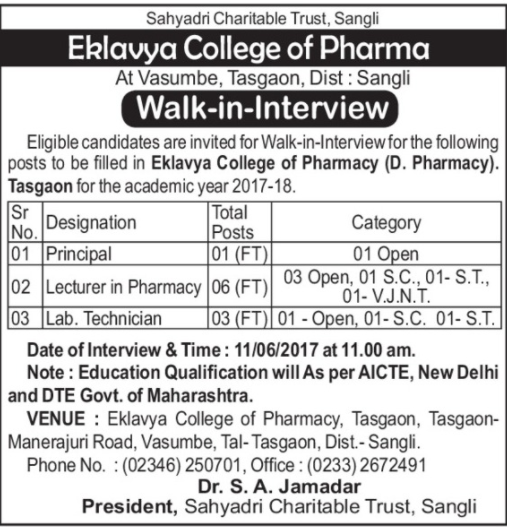 Interested & Eligible candidates may attend for walk in interview along with all the documents addressed at Eklavya College of Pharmacy, Tasgaon, Tasgaon- Manerajuri Road, Vasumbe, Tal- Tasgaon, Dist – Sangli. Starting Date, Last Date to Apply Offline at Eklavya College of Pharma which candidates should be remember as follows. Walk-in-interview Date: 11-06-2017 at 11.00 a.m.